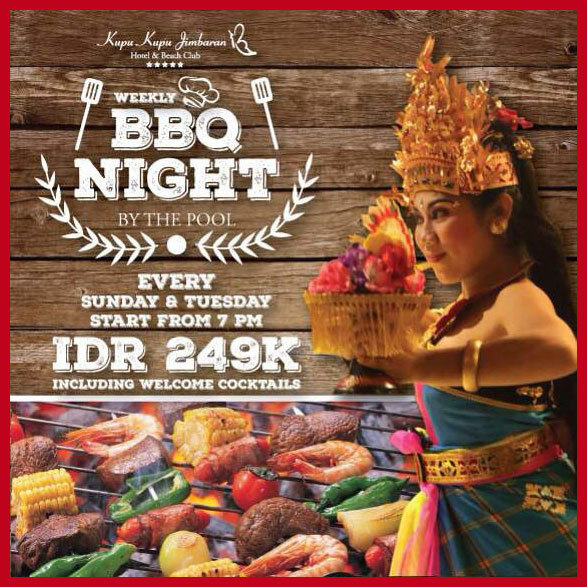 Treat yourself with an ultimate Meat & Seafood Barbeques at Chocolate Café & Topeng Bar at Kupu Kupu Jimbaran. There are many selections of “all you can eat” seasoned meat and seafood barbeques such as tender beef satay with peanut sauce, satay lilit, seafood skewer of fresh fish, prawn and squid, grilled sweet corn, grilled fish in banana leaf, beef reef fish with sambal matah, bacon wrapped chicken in BBQ sauce, creamy chicken, various of salads, creamy potato soup, potato rosemary, beef rendang and the last but not the least, various desserts from Chocolate Café such as blueberry cheese cake, traditional Balinese dessert and many other. The fragrance and taste of barbeques will surely make you crave more and will definitely satisfy your taste buds. The most recommended dishes you should try is the Seafood Skewer, Beef Satay, Beef Reef Fish with sambal matah, beef rendang, and grilled fish in banana leaf. You will be entitled with a glass of Tequilla Sunrise as welcome drink, when you’re having the BBQ with us. The welcome drink might be different from time to time. 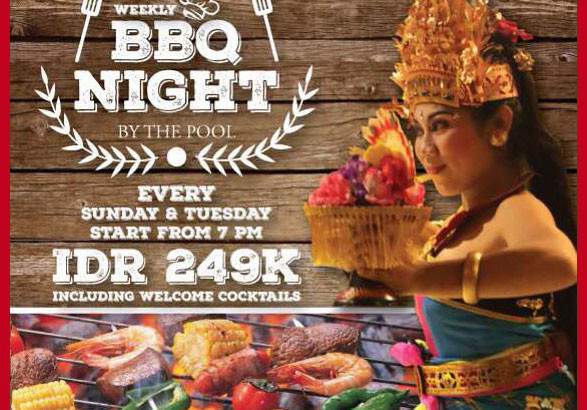 The location of this BBQ night is at Chocolate Café & Topeng Bar, around the swimming pool area. You can enjoy the foods and alongside with the pool view during you BBQ dinner. During the barbeque dinner as well, there will be Balinese Instruments starts from 7 PM and Balinese Dance starts at around 7:30 PM onwards with three different types of Balinese Dance for you to truly experience Balinese culture when having your dinner. Come and join us every Tuesday and Sunday night only at Chocolate Café & Topeng Bar in Kupu Kupu Jimbaran Beach Club & Bamboo Spa by L’Occitane.